The drying process doesn’t work. Breaking the root apart by blending releases the active material which supplies the heat and flavour. Applying heat from the dehydrator effectively destroys all flavour and tangy taste. The dried product is a bit of fibrous material with no character resembling horseradish.I will try drying by cutting into small pieces and not crushing the roots, then dehydration. One of the two garden horseradish plants was dug for processing into powder. This is a new endeavor. The plant was dug carefully and the soil was fairly soft so most of the roots were obtained. Two roots were selected for the 2017 plants and placed in containers, which will be wintered out doors in the ground in a suitable location. The roots were hose rinsed and then washed in the home washing machine. The small discolouring does not reflect in the produced horseradish, meaning to skin the horseradish is redundant and wasteful. The roots were cut into smaller pieces and mixed with water to blend into a slurry. The slurry was poured onto a dehydrating pan, excess water was poured off, and placed in the dehydrator at 135F. The powder making after drying will be added when drying is complete. The powder produced will be kept in a tight container and water or vinegar added when used or used as a dry condiment. Liquid horseradish deteriorates on the shelf and this powder method is to improve the life of the condiment. 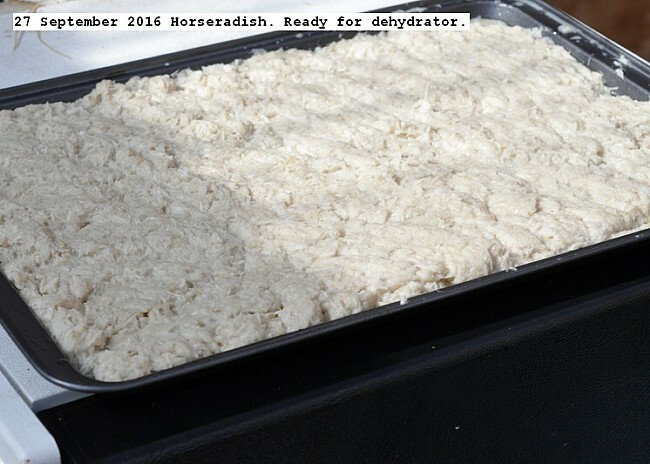 This entry was posted in Uncategorized and tagged 27 September 2016 Horseradish, Horseradish Processing, Horseradish procssing into Powder.. Bookmark the permalink.